It was a staple cartoonist's joke when I was a child that the neighbours who forced you to watch their foreign holiday slides were the neighbours from hell and were really doing it to rub people's noses in it that they were more affluent. My parents were those neighbours! Nowadays cheap flights make it fashionable, even de rigueur for everyone and their dog to travel and for travel nuts to bore the pants off their guests by making them watch footage of a Masai tribesman driving his herd of cattle onto a plain or their partner haggling over a garish rug in a Moroccan market, though in what way this is supposed to make the traveller a better person or a person of achievement is hard to fathom, not least when travel has become such a commonplace commercialised activity, open to anyone capable of putting a plane ticket on a credit card. Sometimes it seems all that remains is to traverse Peru with a table-top freezer balancing on the tip of one finger; ie with a twist! If anything, travel often makes people more tedious than they were in the first place (sic your average loudly-bragging gap-year student) and contrary to what some evidently assume, is no substitute for a personality, though I don't deny there is interest in travelling from the point of view that another culture might have a better way of doing something than we do, which we can potentially steal toward the rescue of our own failing country. And differing turns of phrase and outlook to our own are also not to be underestimated. A cynical and unfashionable viewpoint, not in step with globalisation? Certainly. But then I am suspicious of escapism, be it drugs, drink, extreme sports or travel. In other words 'experience junkieism'. My first reaction is what are these people running away from as often as three times a year? Themselves? Their own country? Is all this travel a throwback to imperialism and the need to conquer, if only psychologically? Are other cultures merely an idle curiosity to be gawked at, photographed, and in the worst cases patronised/exploited, or do travellers genuinely give a damn about them once they've left their shores? Many gap years in particular have degenerated into little more than year-long round the world pub crawls rather than a genuine attempt to see and engage with the wider world, unless a youngster of lesser-endowed parents is forced to work their passage, in which case they probably taste more of the grass roots experience, leaving less time to indulge the mindless hedonism their compatriots are busily shaming our nation's reputation with. Still other youngsters are charged through the nose to 'volunteer' abroad for a year by cynical organisations out to profiteer from the few left who are interested in putting altruism before themselves. A former graduate colleague of mine had a more noble reason than most to travel. He not only sought to interact with and learn from other cultures but to experience deprivation. He had always known a warm clean bed, plenty to eat, plenty to wear, central heating and a power shower and he wanted to know what life would be like when thrown back on his own resources. In short to know if he had any, having grown up as a pampered Westerner, and he planned to cycle round the world on a shoestring budget, risking adversity, relying on the kindness of strangers and getting to know what stuff he was made of, standing himself in good stead for any future national emergency. He set off with a neckful of St Christopher medals and a compass two months ago. We're keeping our fingers crossed! As for knowing myself, I have made this often-painful journey the priority of my life, a journey too often deferred by the distractions of the world including travel (though as you will have gathered, I am not without some experience of world travel). Exploring myself and what I am capable of and pushing my own boundaries has hitherto been the greatest and most satisfying adventure of all and it's not over yet. Better still, the benefits of getting to know and like oneself and working through the after-effects of a difficult childhood last a lot longer than a holiday tan and don't break the bank or enlarge one's carbon footprint either. And do we not also travel in our dreams? I regularly have fantastical flying dreams for which I need no passport, am not limited to a flight path and can't be charged for excess baggage or refused passage for forgetting to transfer a lipstick to a little plastic bag! Environmentalists who jet around the world supposedly promoting environmentalism who come back prosleytising to the rest of us particularly make me laugh and I think they need to take a good look at themselves. I once caused consternation in an environmental meeting by opining that never mind the more limited benefits of all the minor measures we were discussing, where was the national roll of environmentalists willing to sign up to no more than one return flight a year and committing to remain child free, flying and pro-creating being the most environmentally-damaging activities of all? There was a real sense of occasion about flights in my childhood, an occasion which only happened once every two years for us and each airport took a pride in its vast public viewing gallery (now often sadly absent), from which one could watch the majestic air liners take off and land, some children simply brought to watch the big 'silver birds' in action to celebrate their birthdays or for a treat. Airlines made a big fuss of we junior flyers with clubs, free sweets and goody bags on the flight and the odd trip to the cockpit to meet the pilot! Queues and security were virtually non-existent and commercially there'd be no more than a café, a newsagents and a duty-free shop, even in the largest airport. Airport parking was either free or about £2 a week. In Delhi we were even presented with garlands of orange sandalwood flowers when we landed and treated like minor royalty, uncomfortably imperialist as this now feels to my adult self. I retain my complimentary gold Pan-Am lapel badge to this day. Flying these days has had all the fun extracted and is to be dreaded rather than excitedly anticipated, whatever one's motives. As for émigrés, those émigrés who move to a country because they genuinely feel an affinity with that country and its culture and intend to integrate, learn the language, obey the laws and contribute to the economy of their adopted land. Well who can argue with that? I am sure that just as there are people who feel they have been born in the wrong body, there are people who feel they have been born in the wrong country and seek cross-border 'reassignment'. You may assume from all of the above that I don't agree with leisure travel at all. Not so. I merely think we need to travel more carefully, judiciously and fully aware of our motives for so doing and mindful of our effects good and bad on the countries we inflict ourselves upon. Yes, many nations need our tourism pound, but do they need everything else that we bring, and even more importantly, take? And can't we at least reduce our number of flights per year and make travel special again, if for no other reason? In an ideal world travel for all would reduce xenophobia... instead, alas, it seems to fuel it. I miss sitting in front of the telly of an evening and sleeping in my own bed. All that going out in the evening is too much effort. And I'm not going to play Travel Scrabble in a yurt. 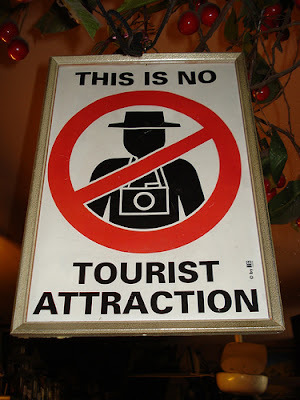 Finally, the tyranny of holidaymakers, student backpackers and holier than thou alternative travellers (and their endless digital photgraphs) properly exposed! If only the News of The World had proceeded along similar lines, we'd all be in a much happier place. I've travelled abroad twice in my life. To Berlin in 1971 and to France in 1997. I just don't have the urge to fly here and there, it's all so stressful. I have friends who have roamed the globe, although they show little evidence that the experience has broadened their minds. Oh, and there's the whole range of illnesses. I've lost count of how many times I've heard, "We were laid low with a bug for the first few days, so didn't move move beyond the bounds of the bathroom. After that, it was great!" I rather like travel. I am not so keen on fleeting trips - but love to temporarily move somewhere and live the life. I don't really know why it is but I thrive on change and travelling seems the safest "change" for me at the moment. But I do believe that travel should be made more expensive. It is ludicrous that it is often cheaper to fly than to travel a short distance by train. If it were more expensive, I would do it less. It's a generalisation, but I do tend to find that people who have never travelled, or perhaps more, who have never lived anywhere else, are less interesting than those who have. But there are exceptions on both sides. But air travel is horrible and I hate it! I loved travelling to distant climes but not anymore as it involvesplanes and airports and I now have horror stories of recent origin even though I'm an elder and no threat to any country. However, I do have Cara my little caravan which I hope to take on the road and explore all of Newfoundland which is vast and interesting and beautiful. I think we need to explore our own backywards before venturing on to anyone else's. Good luck to your biking friend. So travel is for people who just want to show off? Wow. Fleur (a travel journalist) will be interested to note that. With respect, I disagree with you although I can see why you feel this about, say, some Gqp year students. It appears you are basing your views on a few and consequently dismissing people who, say, take photographs. I'm a photographer who has won prizes and had photos on Channel 4. It's why I'm going to New York this month. For me, travel is about curiosity and learning. Qualities without which makes for a rather narrow-minded outlook. I wouldn't dismiss a person who dislikes it or chooses not to travel but travel is a weekend in Eastbourne or a visit to a country house.... Pretty diverse, that 'travel'. Active judgement of those who do travel abroad, however, is a bit harsh! BTW - I can very much see your point about environmental cost and cheap flights! And, indeed, I have been subjected to some very dull footage. One example was someone who stayed in a fully inclusive hotel in Thailand. But it doesn't make anyone a more authentic traveller if they slum it. The point is, to explore and experience. And that's important whether or not it benefits anyone else, although I'd argue that it always will so long as the traveller-tourist respects their place of travel. I also think you made a good point with 'experience junkieism'. There's nowt worse that those '1001 places to see before you die' books. I tend to feel it's better to know one place well than tick off a list but it's just too broad a subject to have any singular stand. Intriguing and thought-provoking! Wisewebwoman - what horror stories are these? Did I say EVERY last person who travels or writes about travel or photographs travel Dan? As you seem to eventually concede, I am talking about travel for the sake of it or for other motives (ie because someone thinks it will make them interesting or furnish them with a personality or something to brag about) rather than for the genuine love of or interest in other cultures. I don't think that you or F would ever need travel for the above reasons, right? In which case I haven't maligned either of you, right? Steve, I feel sure a lot of our issues hark back to the days of Empire and guilt and not knowing how to feel about our own country, let alone in relation to other nations. Italians for example are allowed to be proud of their nation, ditto the French. We admire them all for it, but where are we in the equation? Perhaps we admire other countries more because it's safe to, without being accused of being a paid up member of the BNP! (and assuming we Brits have anything left to be proud of). I find it endlessly fascinating to muse on. It also amuses me that other countries have similarly dire skeletons in their national closet, but for some reason do not take on the guilt of their forebears' atrocities, let alone try to apologise for them decades or centuries later! Geoff, I enjoyed your Staycation posting! Very droll. Neil, well there seems to be this unspoken assumption that all travel is 'a good thing'. I thought it was time to question that. And get my own back on all the gap year bores I've ever met. (more than you might think after 14 years working in Universities, Dan). Also wanted to make the point that there's more than one kind of travel and travel does not have to be restricted to the physical. Martin H. On the occasions I have ventured abroad, I have always felt the need of another holiday to get over it when I returned! Far from returning refreshed I return anxious and disorientated and unable to write a word for some time! I think traversing time zones messes with my head, much though I like the actual flying bit. Wise words RB. If one is going to travel, it should be for a month or two to imbibe the atmosphere rather than short hops. WWW, yes all those X-ray body scanners and assumptions that one is a terrorist rather removed the fun from going anywhere. It's like being frisked and de-bagged ready for prison! No humanity or dignity - we may as well be cattle being processed. Nota Bene - well it seems to work for you judging by your postings. Sagittarian, you have been on an incredibly dramatic journey of epic proportions in the last year without even leaving your town. So sorry to hear your house will need rebuilding. And that you've been on this awful journey not of your own choosing. As for travel being 'for it's own sake'', isn't that one of it's true pleasures? Enjoying the spontaneous unplanned nature of it; the journey, spending an afternoon getting lost. Wandering and daydreaming. I hope you would welcome some contention to what you are saying. The trouble is you are conflating it all in with national pride, racism, privilege, environmental damage and everything BUT seeing it 'for it's own sake'! If you don't like travel, fine - although I do think you are missing something. And I respect your right to express your opinion. I just don't think you've considered it clearly - it seems terribly confused with a host of other issues. I meant 'incur disapproval' or indeed 'cause chagrin'. Hi Laura, both your post and the ensuing comments have made for some thought provoking reading. I would tend to agree with you that huge amounts of travel today, in any form, by car, train, bus, plane, are undertaken needlessly, done simply because we can, and not out of necessity. Vast amounts of energy are thus wasted. I am particularly horrified by all the publicity stunt travelling, simply to get into a record book or into the "news". I hate the squalor and filth of global travel. I remember being on a bus in Chile, standing over its primitive loo, when the vehicle suddenly went over a cattle grid and the urine of 40 passengers flew up into the air and covered me from head to foot. At that point I wished that I'd booked a week in Dorset. I also found the USA incredibly dull: beautiful landscapes, but very boring towns with no cultural life of any sort. The main thing that travel has taught me is how much I love living in England. But I do enjoy nipping over to 'the continent' for some je ne sais quoi! Valid point Ben. And there are still organisations like VSO which do not seek to rip off youngsters for volunteering, probably one of the oldest and most respectable organisations. As for the Grand Tour of the 18th Century, not only did the young nobility of the time have no television to inform them of what lay beyond their shores, the world had only just moved on from the long-held belief (at least in the Western hemisphere) that it was flat and you'd fall off if you sailed too far! We still also had useful stuff to do such as plants and animals to collect and bring back. All classical architecture in Britain is also informed by those tours and is part of what was brought back. Owen, thanks for your lovely and thoughtful comment. Gratuitous travelling for the sake of it is the crux of my problem with travelling. Travelling should be special, an acknowledgement that it is an invasion of another country, however friendly. But yes, I couldn't argue with true love as a reason to relocate either. And your sumptuous blog sharing all your many discoveries with us definitely justifies your own travels! Steerforth, I can relate to what you say entirely. I was as sick as a dog for almost the entire month I was in India as a child. Many public toilets had no loo paper, which my mother also struggled to find in the shops (nationwide shortage?) and I have some horrific memories of that time. On the plus side a couple of days before the Congress we were attending ended, by which time I was mercifully feeling less at deaths' door, we were invited to the palatial home of the Governor of Bangalore for a feast. He had his own private zoo in his extensive grounds and his dining room was swathed in extravagant gold leaf ornamentation from top to bottom! The servants peered over the balcony at us as we ate. The contrast between how the different castes lived was staggering.